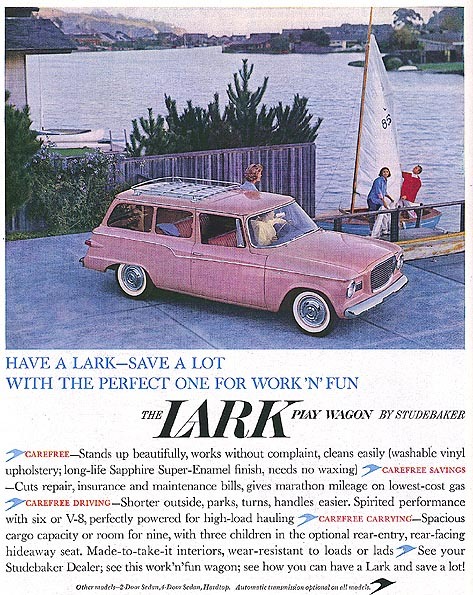 This lovely hardtop is the 1959 Lark by Studebaker. and weighed in at 3,042 pounds. 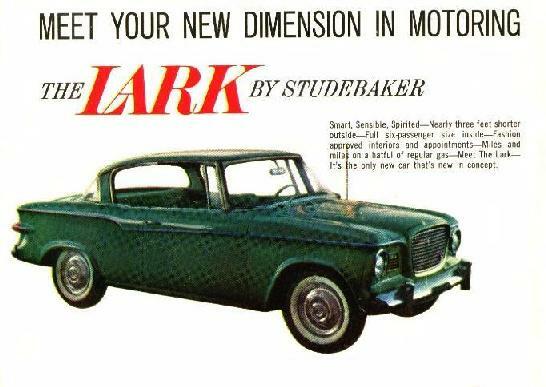 Studebaker had long been part of the domestic automotive scene by the time the Lark appeared on Canada's highways and byways in the fall of 1958. The predecessor E-M-F and Flanders cars were built in Windsor, Ontario starting in 1910. That company was taken over by Studebaker in 1912 and the latter grew to be one of the most popular cars in the country. 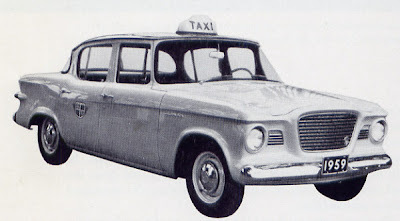 Big and fast, the Studebaker was a favourite of both rum runners and the police during the American prohibition years. The factory closed in 1936 when it became cheaper to build cars in the United States and export them to Canada than it was to build them here. Plans were under way to reopen a factory in 1939 thanks to the runaway success of the inexpensive Studebaker Champion but our 1939 entry into World War Two put those plans on hold for six long years until victory came and the world was at peace once again. was the Regal two-door station wagon. It rode on a 113-inch wheelbase. The stark truth was that Lark was Studebaker’s last hope to stay in business. Nervous management was anxious about its acceptance by the public. The company’s entire future was pinned on the Lark's success. They needn’t have worried, Lark turned out to be the right car, in the right place, at the right time. Introduced during a business recession, those few consumers who were buying new cars were headed straight for small, thrifty vehicles. Many of them were European. 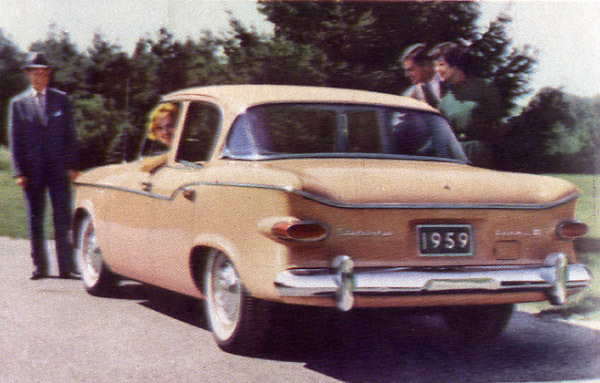 One out of every five cars sold in Canada during calendar year 1958 came from the UK, West Germany, France, Sweden or Italy. The other practical small car choice was, of course, the stylish Rambler by the newly minted American Motors of Canada Limited. The Lark by Studebaker was a step up from the imports, took on Rambler toe-to-toe and turned out to be a smash hit for the old-line, independent automaker. 259-cubic inch V-8 mill stuffed under the hood. 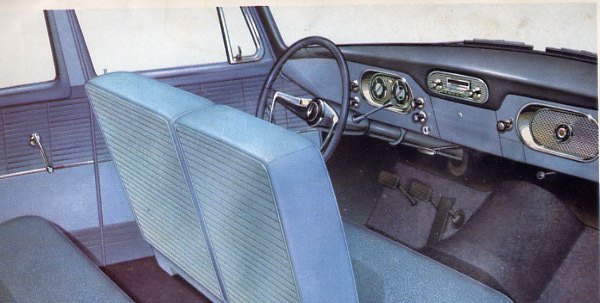 wheels Hamilton could offer in 1959.
padded dash overlay in Regal models. 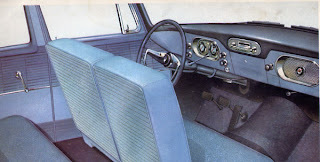 All Larks carried a centrally located glove box. Advertising billed the cars as “haughty and handsome” and “jewel-like.” Folks liked them immensely. In the first two months of the 1959 calendar year, workers built 4,108 cars. January retail sales were the company’s best since 1951. In March of 1959, management was obliged to increase production by 50 percent to keep up with demand. With the move to 48 cars a day, a hundred new men had to be hired to do the job. 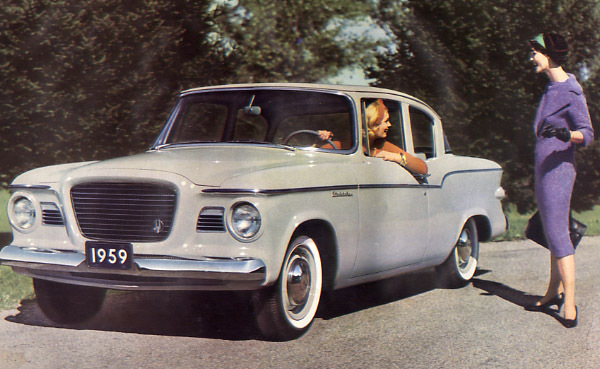 Studebaker boasted it was the friendliest family car in town and that the entire family would love it. Plenty of families did. Studebaker-Packard Canada Limited ranked 13th for calendar year 1959 with a total of 7,686 sales—and that figure included the Silver and Golden Hawk sports cars as well. Factory reports show 7,294 cars were built in the Hamilton facility for the 1959 model year. The company further strengthened its position by selling 189 acres of unused industrial-zoned land it owned on Guelph Line Road near the QEW in Hamilton. That property sale was a good thing because competition stiffened considerably with new compact entries from GM. Ford and Chrysler. Workers would only build 6,446 Larks for the 1960 model year.